STEPPING THE LADDER OF SUCCESS!!! An Inter School Team Competition of Creativity, Quick Decision Making and Problem Solving was held in the month of May in order to test the spontaneity, creativity and logical understanding of the students given a constrained environment. The selected winner students of K.R. Mangalam World School, G.K-II had the opportunity to compete in the Creativity Decathlon Global Finals hosted by the Korean Association of Creativity Education sponsored by Ajou University in Seoul, in the month of August, 2017. K.R. 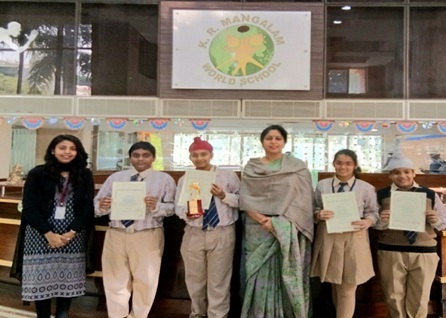 Mangalam World School, G.K-II made a mark in the event with three students namely, Angad of class VII, Akshay and Ravyaraj of class VI bagging the First position and indeed adding another plume to the saga of our success. The Principal Ms Alka Awasthi congratulated the students for bringing laurels to school.